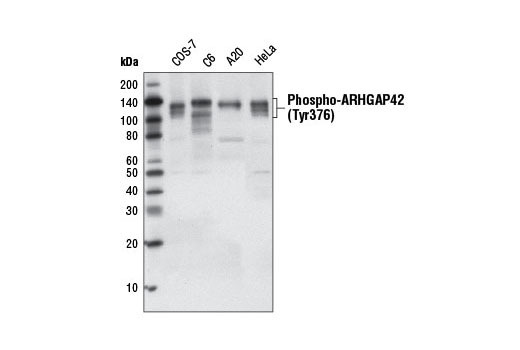 Western blot analysis of extracts from COS-7 cells using Phospho-ARHGAP42 (Tyr376) (D45E9) Rabbit mAb. The phospho-specificity of the antibody was verified by preincubating the antibody with no peptide, phosphopeptide, or the corresponding non-phosphopeptide prior to incubating the membrane. Western blot analysis of extracts from various cell lines using Phospho-ARHGAP42 (Tyr376) (D45E9) Rabbit mAb. 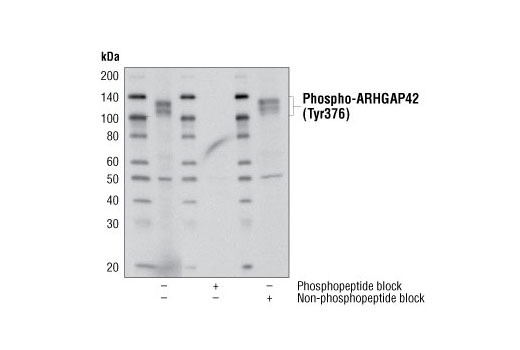 Phospho-ARHGAP42 (Tyr376) (D45E9) Rabbit mAb detects endogenous levels of ARHGAP42 only when phosphorylated at Tyr376. Monoclonal antibody is produced by immunizing animals with a synthetic phosphopeptide corresponding to residues surrounding Tyr376 of human ARHGAP42 protein. ARHGAP family members activate Rho GTPase proteins (1). Mutations of ARHGAP family genes lead to carcinogenesis through the dysregulation of Rho/Rac/Cdc42-like GTPases (2). Little is known about the biological function of ARHGAP42, a member of the ARHGAP family. ARHGAP42 contains a RhoGAP domain in the middle of its sequence, an SH3 binding domain at the C-terminal end of the protein sequence, as well as a BAR domain and a PH domain in the N-terminal region of the sequence, which indicate that the protein may function as GTPase activator and cytoskeletal adaptor. Katoh, M. and Katoh, M. (2004) Int J Mol Med 14, 333-8. Katoh, M. and Katoh, M. (2004) Int J Oncol 25, 1201-6.